We don’t want to get all militant about this, but come on people, there are some really bad attempts at writing ‘5-a-side’ out there on the internet and it needs fixing. It might seem like a trivial detail (and not our most action-packed blog post), but it is important to get it right if you are advertising a tournament, running a business or just simply want to be grammatically correct. 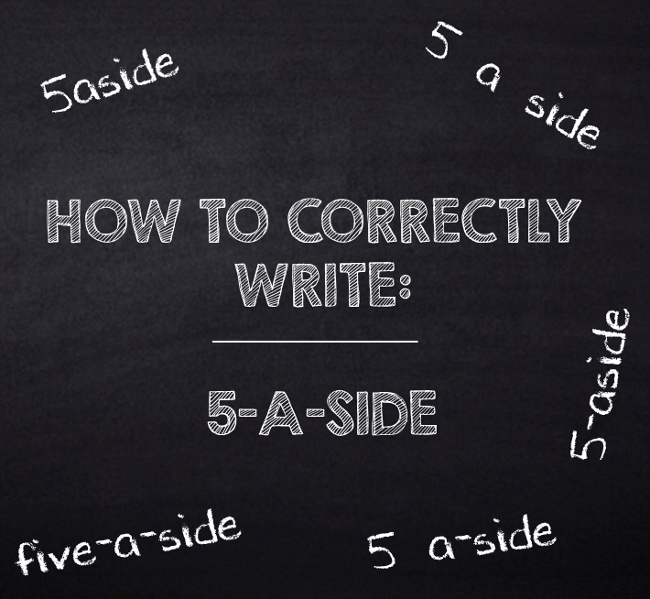 Let’s cut straight to chase; these are the only two correct ways to write it: ‘5-a-side’ or ‘five-a-side’. Either of those methods are fine, with the former tending to be used a bit more frequently in ordinary usage, just because it keeps things a bit more brief. However, if you are writing in a newspaper or a more official document, you’ll want to go with the more formal text of ‘five-a-side’. 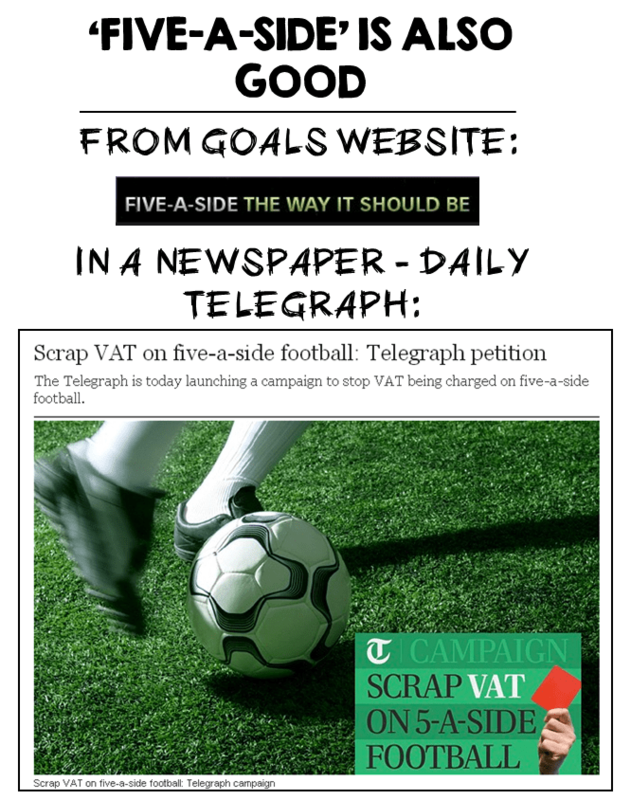 Notice that when it comes to the Telegraph’s graphic for their VAT campaign, they still go with 5-a-side. It just shows, both are fine. The thing to note here is the use of hyphens (the little dashes between the three words). Hyphens exist to glue words together, showing that the words are linked in some way. Generally a hyphen should be used where you need to link two or more words before a noun or where they represent a single idea. So, for instance ‘state-of-the-art design’ is one example of where you will want to sprinkle some hyphens in. 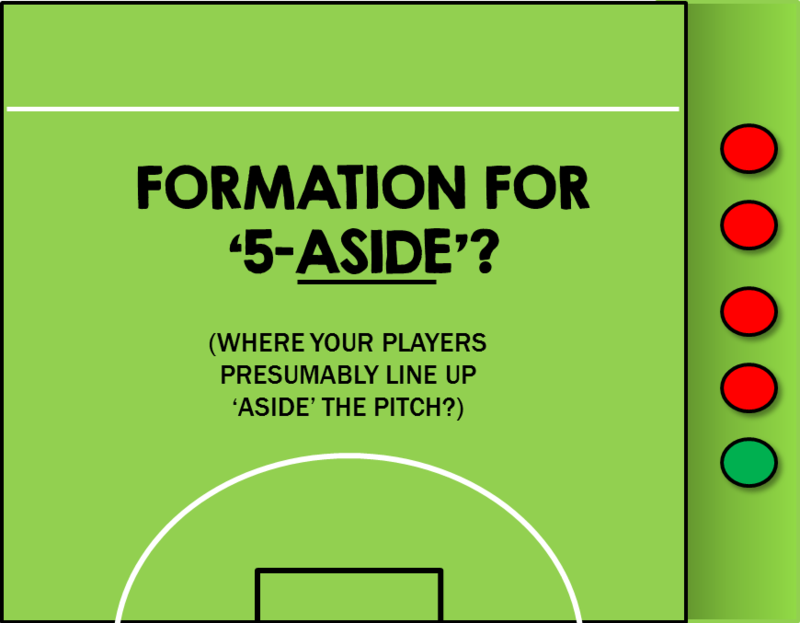 In the same way, if you are writing ‘5-a-side football’, you should hyphenate the words before the noun (‘football’) to show that it is indeed football played with 5 on each side. 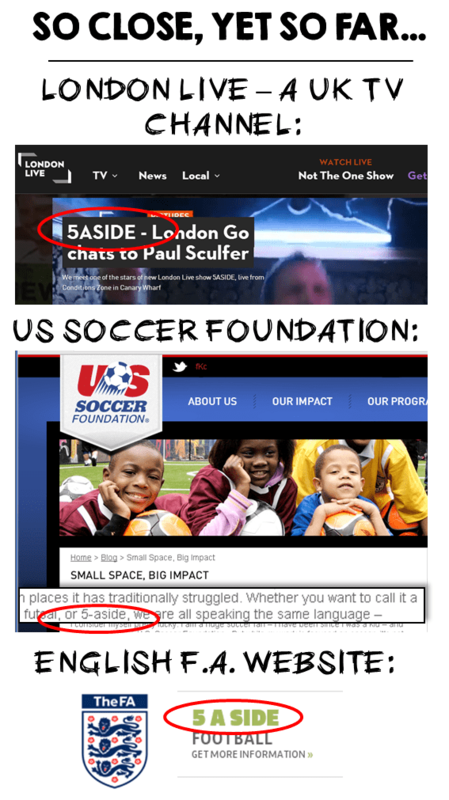 Often the approach of the unsure writer is to decide to go with the spelling ‘5aside‘. Whilst that’s fine if you’re writing a tweet and are short on space, it’s clearly not the proper way of putting it. It’s supposed to be three separate words so don’t mash them awkwardly into a single one. First, it gets written without any hyphens at all: ‘5 a side‘. It’s an improvement on collapsing it down into a single word, but it’s just not quite right – link those words together with some hyphens. You know it makes sense. 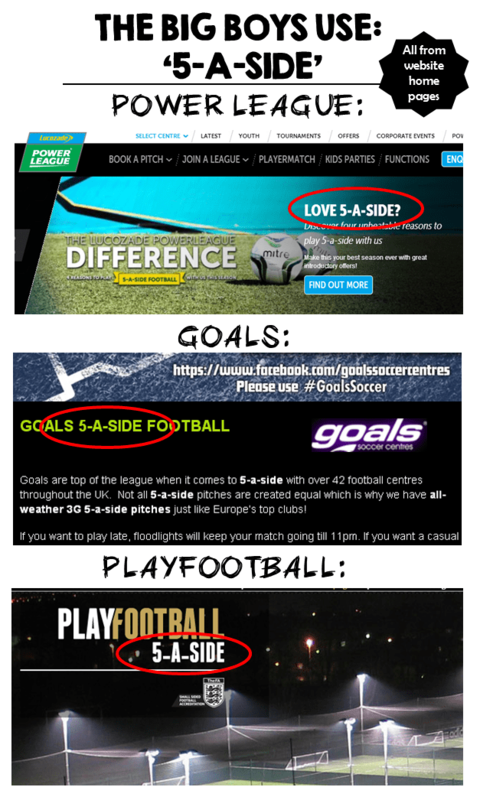 ‘5 a-side‘ – why link two of the words using hyphens, but not the other? Gramatically this makes no sense at all and just adds confusion. An ‘A-side’ is a term that used to refer to the main track on a CD or record single (as opposed to the B-side, which was usually a rubbish supporting track that they were giving away with it). The point of this article was simply to help you, when you’re writing 5-a-side. We see a lot of tournament flyers each year (in 2014 we posted over 40 tournaments in our directory) and some were badly let down by basic spelling and grammar issues – not least, writing ‘5-a-side’ incorrectly. As you saw from the examples above, people often get it wrong. They’re not perfect and neither are we – if you search this site for spelling and grammar errors, you probably won’t have to look to far before finding a few clangers. Hopefully, with this post out there, it’s going to help people putting together their websites and advertising their tournaments to look like the professional set-up that they should be. Instances of sitting there and thinking ‘how do I write 5-a-side?’ should be a thing of the past! Have you heard of any others? Let us know.